Driven by competition and rapid disruption, banks increasingly spend on technology enabled models targeted to improve customer experience and service capability. What are the recent developments and top priorities of banks in 2018? Fintechs and new entrants are driving evolution in financial services as they set new standards and change customer expectations. The disruption is forcing banks to rapidly adopt new models as fintechs bring broader financing access to customers through new products and frictionless digital processes. Market places and P2P models are expanding reach while new mobile payment models have taken a stronghold. Technology companies like Amazon, JD Finance, and Ant Financial have rapidly expanded market reach, bringing innovative experience to their customers through their vast exiting touch points. Some of these fintechs are eating into bank’s businesses while others are becoming partners to banks bringing with them simple, frictionless and agile services that improve customer experience. The future is all about what a customer needs. Forced by the disruption, banks are now rapidly revisiting their existing technology platforms and applications. Leading banks are re-designing their processes to be customer-centric, while operations are digitised. The focus is now on improving customer journeys. Banks realise the need to integrate silos of products, channels and data to have a relevant offering and shift their legacy systems to services oriented core systems and clouds. The business processes are being overhauled, enabled with new emerging technology such as artificial intelligence (AI), big data analytics and application programming interface (API) banks are expanding digital and integrating physical presence to make customers’ experience more frictionless. The Asian Banker conducts The Financial Technology Innovation Awards every year. This year it received an extensive response with over 200 submissions in 2018 across countries for different categories of projects that were completed in 2017. The survey results indicate the key priorities, technology and digital journey of banks. We find that there is now a strong focus of banks on being able to better manage customer journeys. This requires multipronged initiatives at both the front end and the back end. Leading banks aim to embed banking into the lifestyle of customers using emerging technologies. There has been a rapid increase in application of AI by banks to improve the customer experience and their operational efficiencies. Commonly categorised these include firstly, implementation of virtual assistants or chatbots across different business functions, including voice based solutions. Secondly, AI and machine learning based solutions for actionable real time intelligence from big data from social structure. Thirdly, making the back end processes more agile and efficient through the use of machine learning and robotic process automation. Chatbots are being expanded into niche areas to solve targeted customer queries and improve experience as the natural conversation skills get better. From deepening the customer experience to increased productivity for employees, most of the leading banks in Asia Pacific are at different stages of exploring the use of this technology. Notable examples include OCBC Bank, which implemented chatbots in different functional areas, for example ‘Emma’, a home and renovation loan chatbot by the bank has handled over 80,000 customer queries and garnered more than $100 million of loans since its launch in April 2017. In addition, the bank has launched an AI based chatbot to address HR queries which can detect voice and text commands, ask for more detailed information, and provide answers to over 6,000 questions built into the database. Furthermore, it provides personalised responses to individual HR queries such as leave balances, tracking their reimbursements and other HR related matters. Emirates NBD replaced its interactive voice response (IVR) at the call centre with one of the first voice based chatbot service in Middle East. The complex maze of IVR which often requires multiple entries from customers and a long wait leading to a frustrating experience for customers is solved by this chatbot which can intelligently navigate the customers with simple voice commands in English and Arabic. The customers are presented with automated resolutions or transferred to the right skilled agent. It provides a seamless machine to agent handshake as the calls are routed hence the agent is aware of the intent of the call before he addresses the customers. This improved end to end fulfilment on phone banking from 11% to 19% while bringing overall 50% reduction in the time taken to digitally serve a customer as compared to IVR. Yet AI technology is still at an early stage of development. Its role is expanding across channels and speech based conversational skills but in many cases the implementation is still limited to basic inquiry and simple transactions. 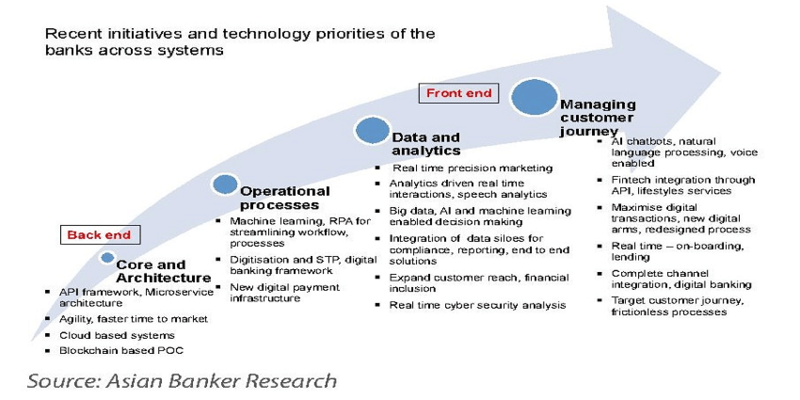 Banks now need to further explore its potential, its ability to manage complex tasks and strengthen its application through advanced analytics for deeper insights. Machine learning based robotics process automation(RPA) application is also rising as it can facilitate greater agility, stream line workflows and reduce errors by automating manual back end processes, freeing manpower to be channelised to other functions. For instance, ICICI Bank uses RPA to perform over one million banking transactions in back-end operations every day, reducing response time by 60% and improving accuracy. These software robots are deployed in over 200 business process functions of the bank across retail banking, agri-banking, trade and forex, treasury, and HR. Among other examples ANZ Bank is using RPA to process payroll, account payable, mortgage procession, and human resource (HR) functions. Barclays Bank has implemented RPA for processes such as fraud detection, risk monitoring, account receivables processing, and loan application. Siam Commercial Bank in Thailand isusing RPA for automating processes such as KYC of customers for juristic on-boarding. AI is helping banks to shift processes from humans to machines. However, as its application increases, banks also need to rethink and constantly redesign their processes, previously designed for humans, to bring optimal returns. The combination of the ability to do real time big data analytics and artificial intelligence applications can bring significant benefits to customer intelligence, precision marketing as well as improved risk management, which some of the new players in the industry have already started exploiting. Many traditional banks however still grapple with silos of data, and are now striving to integrate these to have a more comprehensive view of their customers. Furthermore, as the regulatory compliance requirements become more complex with new requirements such as IFRS9, FACTA, the banks are being forced to integrate these data systems for also comprehensive reporting needs. Meanwhile, some fintechs are a step ahead, readily using the dynamic unstructured data to build credit risk profiles of unbanked customers towards extending financial inclusion and providing greater finance access. For instance Welab, Hong Kong based fintech company founded in 2013, is using AI and unstructured big data analytics from mobile to assess the credit worthiness of borrowers to take a decision within seconds. It analyses unstructured mobile big data to make credit decisions for individual borrowers, creating seamless mobile lending experiences. The company also licenses its technology to banks and telecommunications companies. Selected challenger banks have entered the market and are looking to integrate big data information with AI and machine learning. WeBank, first online only bank in China provides financial services to those who are not qualified for the traditional financing service. With an advantage of data access from its major shareholder Tencent, it is able to analyse multiple data points such as online activities, payment behaviour etc to build a comprehensive customer insight system using which it is able to offer precise promotions. WeBank’s online personal loan platform for WeChat and mobile QQ users, Weilidai has grown to provide about $50 billion loans in 2 years. Banks increasingly realise the necessity to keep up with the competition from new entrants that lack the baggage of silos of data. Being able to use the data effectively remains one top priority of most banks in the region. API applications are changing the financial services models. Best institutions are moving towards an open ecosystem to collaborate with fintechs that provide niche technologies, for better service offerings and customer experience. This often works in a mutual interest as it expands the market reach for fintech as well. Gunnar Berger, head of open banking at Nordea explained that the proactive banks are reaching out to third parties and more specifically to fintechs that can develop solutions quickly, are potentially more innovative and have better understanding of customer user interface. Banks themselves are sitting on assets that fintech lack such as a big customer base, trust of customers, secure transaction system, and compliance process and security. It is quite a good marriage to team up the two and create more comprehensive offerings. For instance, one of the companies working with Nordea Banking in its open banking platform is BankiFi. Conny Dorrestijn, founding partner of BankiF noted that banks now no longer need to be locked into ‘old’ technology, but they can connect their customers with the new world of fintech and true value, whilst also offering them the security and robustness they expect from a bank. There are several examples in the financial industry towards an open banking environment. Barclay has an API store which provides two open banking environments – Sandbox and Live. In Asia, OCBC became one of the early entrants having launched its API platform which provides over 40 transactional APIs. Leading banks target to improve the lifestyle services and engagement with customers through their innovative service offerings through API. 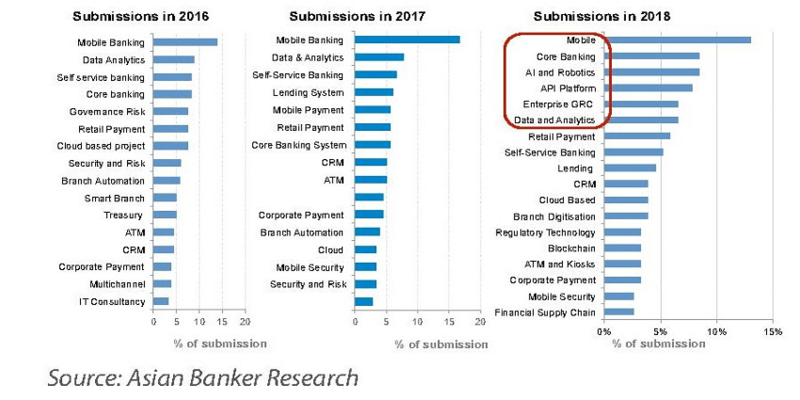 DBS Bank launched one of the largest banking API developer platform in November 2017 that included 150 APIs across 20 different categories and 50 live partners consuming these APIs. It is focusing on real time payments and offering services across lifestyle of customers. It has integrated with companies such as AIG, McDonald’s, MSIG, PropertyGuru, etc to add to customer convenience. Among other banks, ICICI has a wide array of APIs to leverage on the technology of united payment interface (UPI) in India, and it has developed partnership with players like Swiggy, India’s food ordering and delivery platform to provide instant transfers on the go. API networks are facilitating banks to extend banking services to a larger customer segment, that were previously not in their ambit. RAKBank for example partnered with a fintech C3, UAE’s biggest payroll service provider through API, to offer remittance services to over half a million blue collar customers digitally through their mobile phones instantly. Companies are also looking for geographical expansion through APIs. Stripe,for example, launched its operations in Hong Kong and integrated its services with Alipay and Wechat pay through APIs, connecting Stripe’s businesses in 25 countries to millions of Chinese consumers. In Europe, regulators added a new thinking to open banking models with their revised Payment Services Directive (PSD2) and UK’s open Banking regulations from Competition and Markets Authority (CMA) that kicked off from January 2018. This comes with unique threats and opportunities for incumbent banking players as it will foster greater competition with new entrants like fintech having greater access to data to provide new services offerings to customers. On the operational front, managing data security, privacy, authorisation, authentication and consent are some of the key challenges that institutions will need to manage as they implement open banking. Banks will not only need a secure API platform and processes around it but also a strong consent management system and coming under its domain will be issues like who has the access to what data, based on who has given consent and who is responsible for security of that data. Several banks have piloted projects using this, some of which are now maturing to production stage as live use cases, especially in cross border payment and trade finance. The industry is exploring the use of this emerging technology in niche areas, even though its large scale implementation still remains few years away. 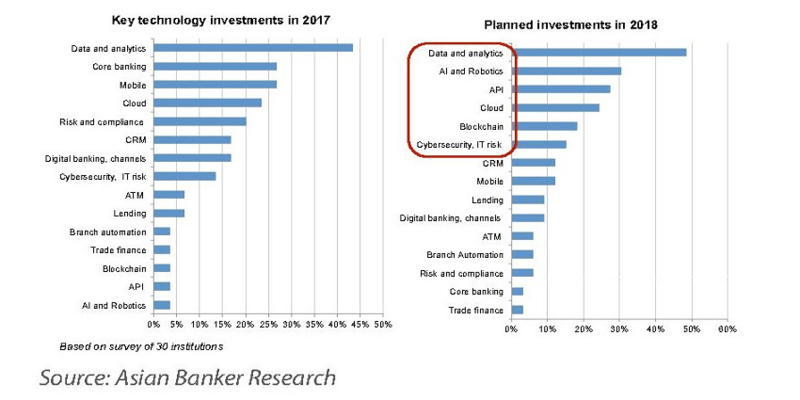 Several use cases emerged in 2017, including some interbank alliances. For instance in China, China CITIC Bank developed an interbank blockchain technology alliance for trade finance with four banks to establish an electronic information transfer platform of letter of credit and trade documents, bringing greater transparency and speed. With technical optimisation the platform’s processing performance has reached more than 1,000 transactions per second, which can support large-scale business needs and transaction volumes have grown significantly. 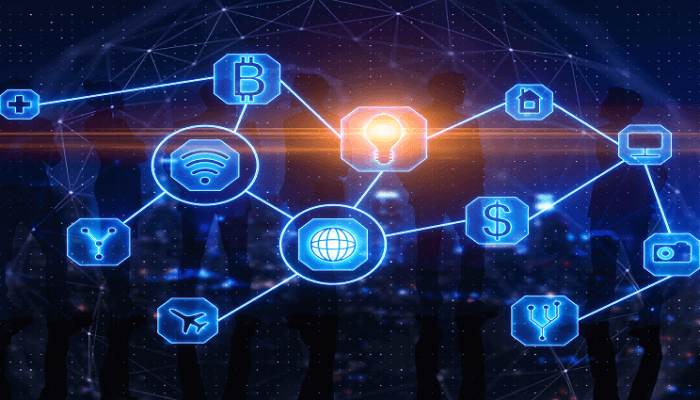 In another example, WeBank-led Financial Blockchain Shenzhen Consortium (FISCO), the financial blockchain alliance that connects industrial peers, now has about 80 institution members from financial industry. WeBank also launched a blockchain-enabled reconciliation platform across multiple financial institutions in a production environment. As of the end of 2017, over 10 million live transactions had been recorded successfully on the blockchain with no system downtime. Among other examples, Santander became the first UK Bank to launch international payments to retail customers in multiple countries using blockchain technology. The payments made on the app will reach their destination within one day, versus three to five days on average for traditional wire transfers. Several new corridors in blockchain based cross border remittance have also been seen developed by banks recently such as RakBank and Axis Bank, Stanchart Bank etc. While Emirates NBD and ICICI have piloted operations in a blockchain based cross border trade finance. Blockchain pilots are now proliferating however the large scale implementation will need advancement of technology with greater standardization of processes along with interoperability into scalable global networks. These will also need approval from regulations, especially when implemented in multiple jurisdictions. The digital ecosystem is rapidly evolving and the banks are forced to revise their roles as well as compete with new players. The institutions increasingly realise the need to change their systems and processes to be able to provide more customer centric and seamless services. However, as banks are learning now, the success comes by focusing on customers not on products. Emerging technologies are enabling financial services to become more embedded in people’s daily life. The technology implementations are increasing but institutions also need to bring a shift in the mindset, how they think about serving customers along with redesigning of processes. Overall, there are five big technology areas that we believe will continue to remain focus for banks. First, big data and analytics to drive customer intelligence, precision marketing and risk control. Second, AI, machine learning and robotics as they expand their service capabilities for greater efficiency and combined with big data to provide actionable intelligence. Third, open API systems and new fintech collaborations for expanded service capability. Fourth will be new proof of concepts in blockchain, including multiparty networks. And fifth is need for adaptive security architecture for cyber security including biometrics and multilayered security protection systems. "The companies that are making a huge impact aren't the first one with the idea"